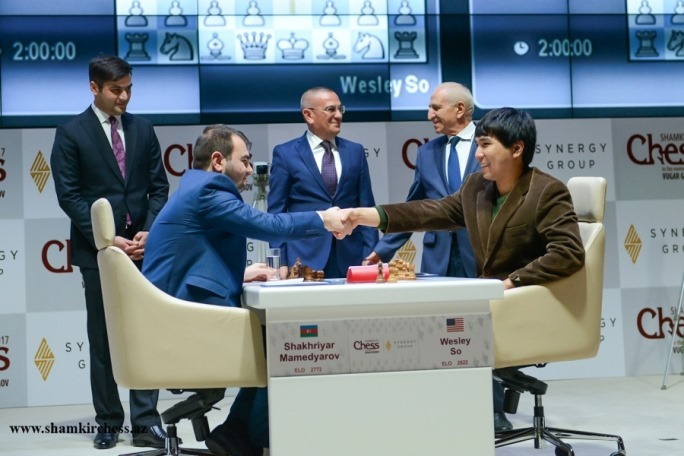 Wesley So’s 67-game unbeaten streak was ended by Shakhriyar Mamedyarov as the 2017 Gashimov Memorial got off to a spectacular start in Shamkir on Friday. 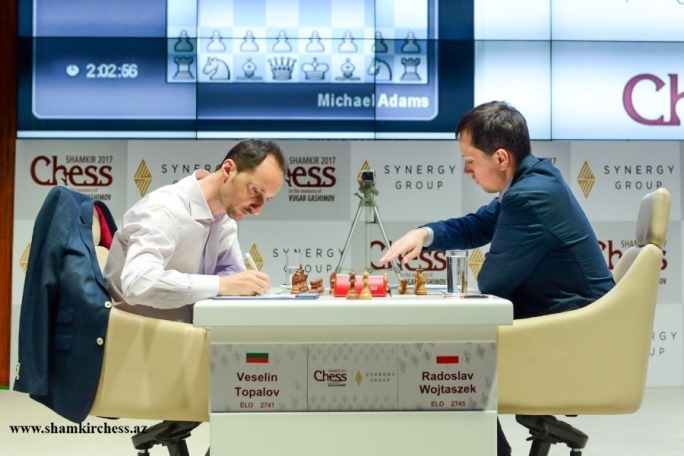 Time was a big factor, as Wesley failed to adjust to the lack of increments before move 61 and blundered with seconds on his clock. 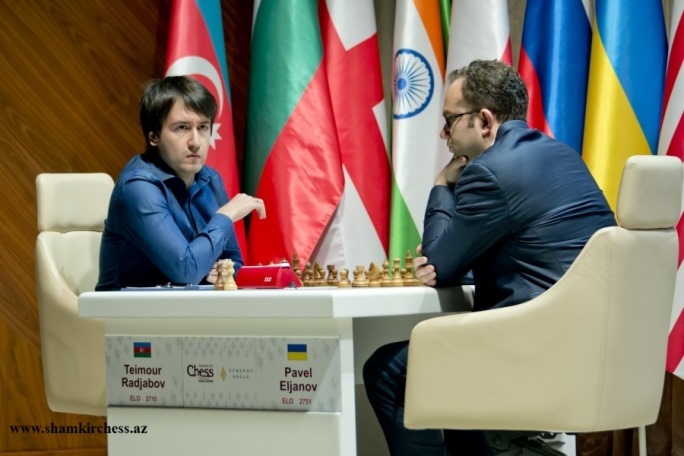 Teimour Radjabov survived even greater time trouble but couldn’t avoid defeat against Pavel Eljanov, who then went on to take the early lead by notching a win over Harikrishna in the second round. 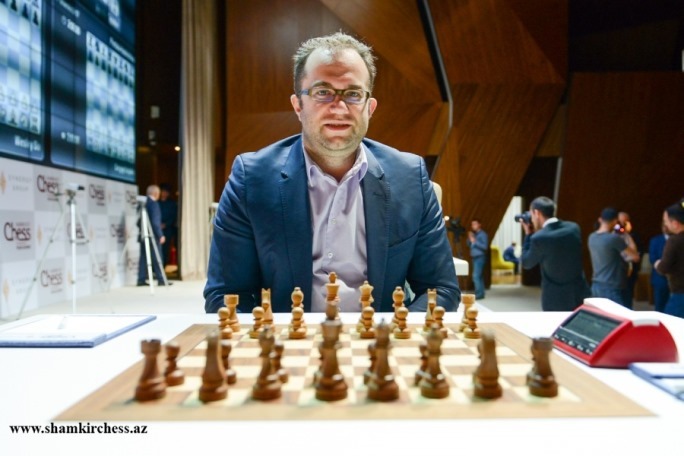 After the US Championship he arrived early in Azerbaijan on Sunday 16 April, so would have been well-rested before his first round game. He faced the 2016 winner of the tournament, local hero Shakhriyar Mamedyarov, but as the world no. 2, the hottest player in the world over the last year, and with the white pieces at his disposal, he had no reason to fear going into the game. In fact, his surprise choice of the Scotch Defence (1.e4 e5 2.Nf3 Nc6 3.d4), an opening he’d only tried a couple of times before, suggested he had high ambitions. From there on, though, things didn’t go according to plan. Shakhriyar said afterwards he played a line with the aim of drawing, but Wesley seemed unprepared for some old theory and burned up over 40 minutes on moves 9 and 10, in a position seen many times before. 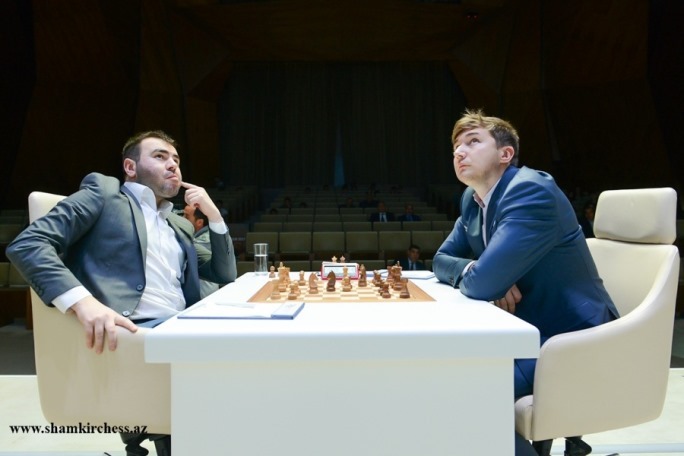 Mamedyarov later became ambitious himself and returned much of the time bonus, but it was Wesley who found himself in an extremely unpleasant situation: around two minutes to make 10 moves in a very sharp position on the board. Normally when we say that we need to add the proviso, “though the players also get a 30-second increment per move”, but here that wasn’t the case, as the increment would only be added from move 61 onwards. With that extra 30 seconds here Wesley would undoubtedly have played 39.gxf3!, or at worst 39.Kxf3! ?, but with 13 seconds remaining he panicked and went for 39.Qxf3+?? Perhaps subconsciously the fact he was giving a check appealed, since it seems you’re restricting your opponent’s options. Alas, one of those options was 39…e4! and it’s simply game over. For instance, 40.Qa3 Qxc4+ 41.Kd1 Rb1+ and mate next move. In Round 2 Wesley had to start from scratch, as he did with a double-edged draw against Mickey Adams. 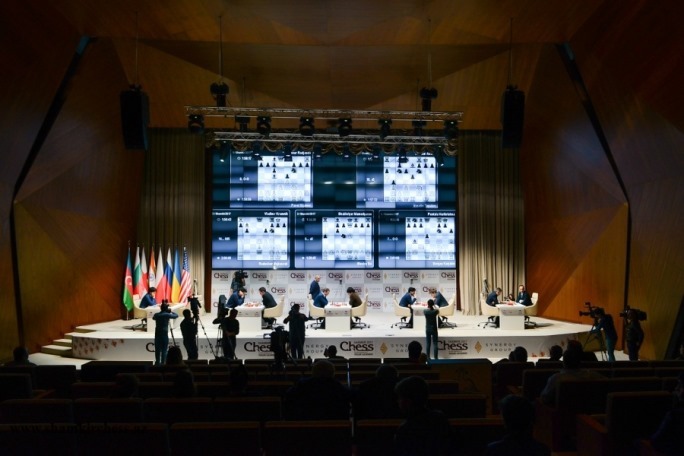 Mamedyarov could consolidate his great start with a quick draw by repetition (draw offers are banned until move 40) against Sergey Karjakin, who he seconded in the recent World Championship match and considers a good friend. Here Teimour, playing Black, blitzed out 34…Bd5? !, but it seems after that he all but lost by force, with the knight dominating the bad bishop and Pavel Eljanov’s king finding a path into the position on the dark squares. Instead 34…Bd7! looks to have been the move, keeping an eye on the f5-square and protecting the b5-pawn in case Black wants to push the c6-pawn. The game only lasted for 6 moves after the time control at move 40. He played 17.Qxe6?! dxe6 18.h6, while it seems that even if he felt there was nothing better than the queen exchange he should have forced Black to waste a tempo on it, immediately playing 17.h6!, when 17…Qxd5 18.Rxd5 would develop another white piece (17…Qxh6? loses on the spot to 18.Nf5!). Eventually Hari was left defending a difficult ending a pawn down and had to resign on move 54. What does Black have to work with? Well, for now he has a better-placed knight... What would become the key factor was that Kramnik was able to put a rook on the 2nd rank and cut off the white king. Vladimir actually came very close to drawing blood from a stone, but he finally had to concede a draw after 83 moves and 7 hours of play. 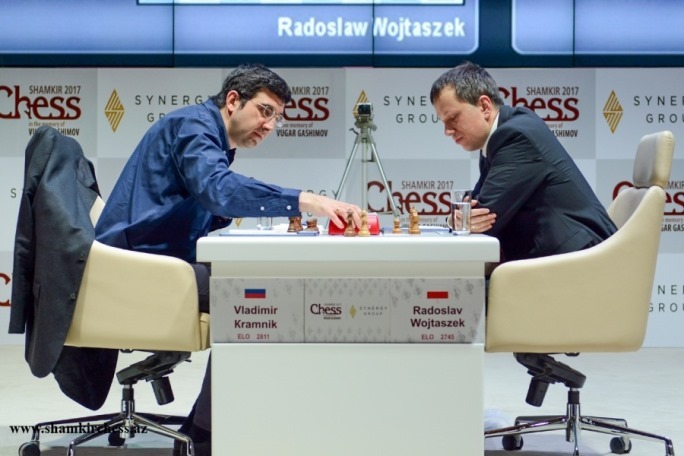 In the second round it was the same story as Kramnik sacrificed a pawn for a positional clamp and went on to torture Radjabov for 73 moves before a draw by repetition. It may not even be the best move in the position, but who could see and resist the beautiful 22…Rxb2!! White can grab the queen with 23.Qxe7, but after 23…Rxc2 24.Qe5 Rxd2+ White’s days are numbered. …but the white king was simply too exposed to the black pieces. Wojtaszek instead had to try 25.Kf1, but it’s understandable the prospect of leaving his h1-rook boxed in didn’t appeal. That meant that going into Round 3 Pavel Eljanov led on 2/2 ahead of Mamedyarov and Topalov on 1.5/2. 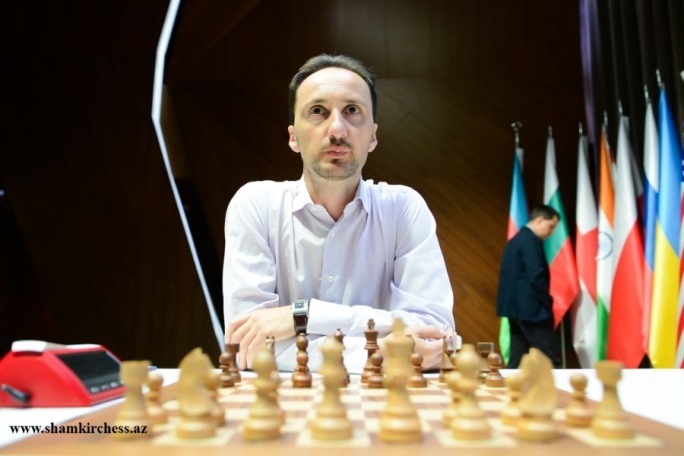 The big clash in Round 3 is the biggest grudge game in world chess – Topalov vs. Kramnik. It looks set up to favour Veselin, since he has the white pieces, is in form and is facing an opponent who’s spent 15 fruitless hours at the chessboard in the last two days. However, as we know, anything could happen with these two players!